Svartisen glacier. Photo: Trym Ivar Bergsmo. Engenbreen ice fall, part of Svartisen glacier. Photo: Trym Ivar Bergsmo. We joined Ivar on an amazing day trip from Bodø to Svartisen glacier for a day. He was an amazing guide with years of experience. We felt very safe with him. We explored the glacier and learned very interesting facts. What an experience for South Africans! We highly recommend using Ivar. He offers great value for money and it’s very easy to book and pay online. Shuttle boat and rental bike not included in price. 6 - 8 h from meeting point (ice time: up to 4 h.). Day trip from Bodo to Svartisen and back: approx. 12 h.
Min: 4 people. Available for groups. Please see details below. May - September. In winter season the glacier is totally covered with snow. Is this trip for me? Moderate fitness and agility is required. Grading: This trip is graded as Moderate – Blue grading. The degree of difficulty and the precise route is carefully chosen to fulfill the desires and physique of the group itself. Minimum age: reccomended minimum age is 10 years. Terrain: After leaving the shuttle boat, there is a bicycle ride approx. 3 km along a flat gravel road. Then 1.5 km steady, well-graded uphill walking for 1 h to reach the glacier. The route follows paths, some parts in a bit rugged terrain and slabs with no trails. Total length: 4.5 km each way to reach the glacier (3 km bicycling, 1.5 km hiking). Not to forget the distance from Bodø, 160 km. Elevation: starting point is 2 metres above sea level. Maximum elevation on the glacier will be no more than 4 – 500 m a.s.l. Personal clothing: 3 – 4 layers of varm upper body clothing, gloves, a varm cap. Raincoats may be suitable if rain. Jeans are not recommended on wet days as they become very cold and uncomfortable to wear. Sunglasses and sun protection is important even if cloudy. 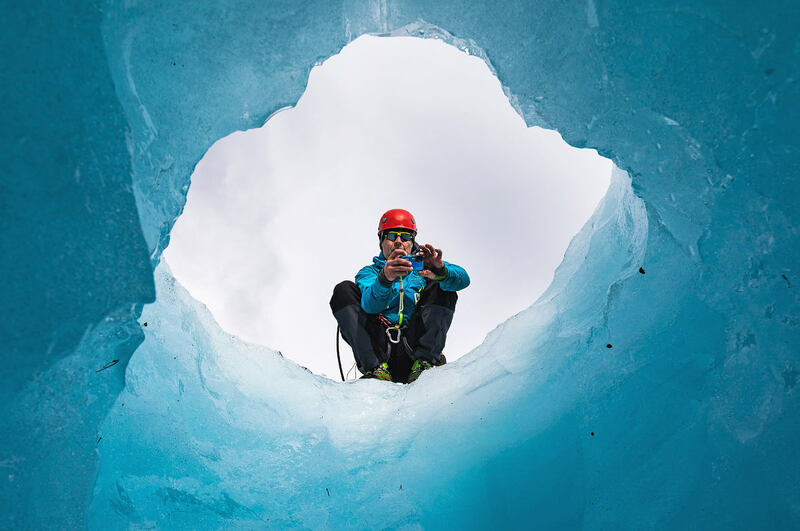 Specialized glacier gear: helmet, harness, ice axe and crampons for superior glacier grip. The meeting point is the pier at Holandsvika (see map above) by the Coastal Highway, FV 17. Holandsvika is located 24 km south of Glomfjord (if you start in Bodø) and 11 km from Halsa (if you come from the south). Where is Svartisen located? Svartisen is located 160 km south of Bodø along the Coastal Highway, FV 17 . If you start from Bodø we recommend to estimate 3 h driving. Then you will have some margin and time for a few stops on your way. 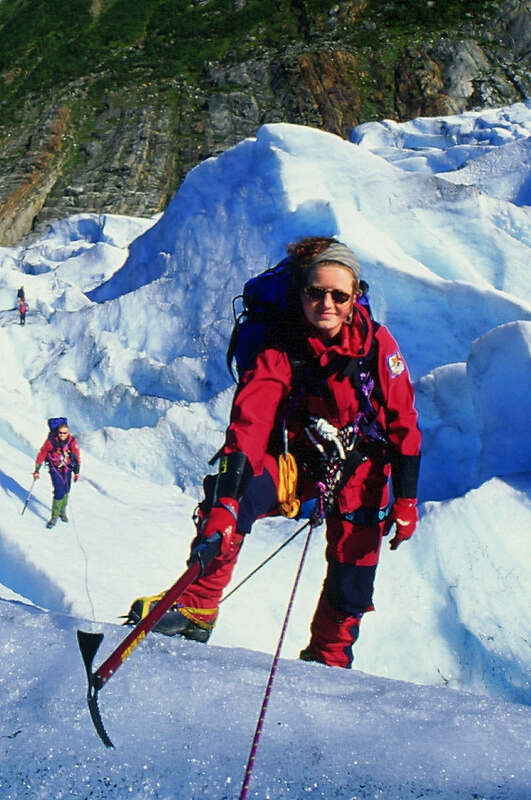 How to get to Svartisen glacier? Transport is not included in the price. Feel free to ask if you need help to figure out how to get to Svartisen. You might join us if the guide anyway starts from Bodø. That we will know a few days ahead the trip. Rental car is recommended. Public transport for a day trip might be a bit tricky. Getting to the glacier by bus from Bodø to Holand might be an option. Bus is a good option if you stay one or more nights by the glacier. Check timetable for bus Bodø – Halsa and make sure to leave bus at Holandsvika. Shuttle boat from Holandsvika (our meeting point) is not included in our price. Check timetable and info for shuttle boat Holandsvika to Engen. Larger groups can easily join this trip, then we will we divide the group into smaller groups of 6 (8), each of which trip are accompanied by their own guide. Please note: we will never mix a private group trip with lone travellers. Normally no need to cancel due to weather. The only exception is extremely strong wind and/or heavy rain. 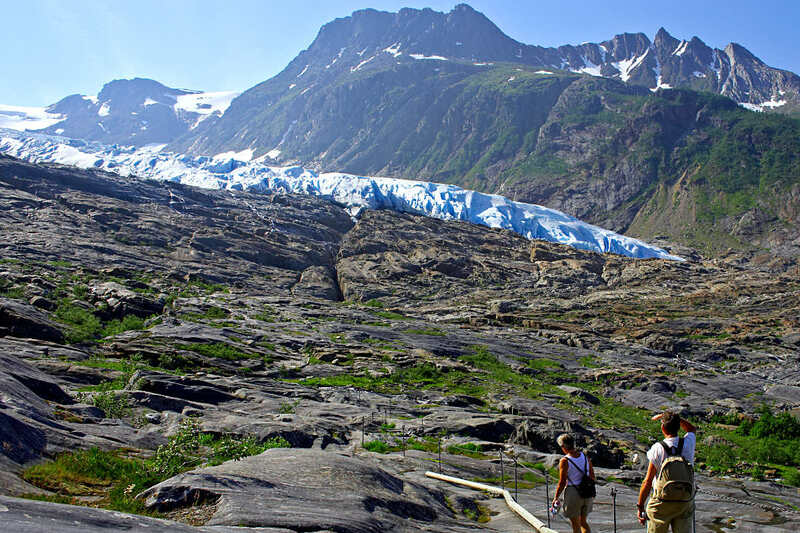 A guided glacier hike at Svartisen could be done even in rainy weather if you are well dressed. 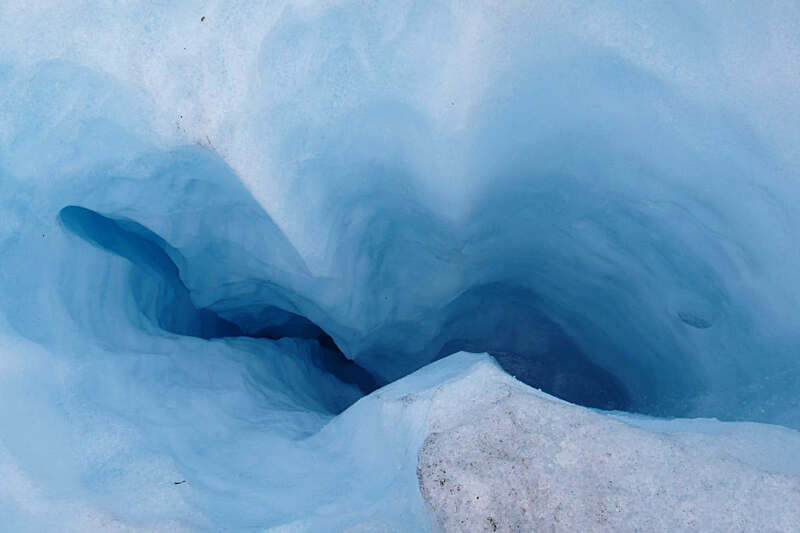 A little known fact is that the rich blue hues in the glaciers are more vibrant to the eye on an overcast day. If weather turns bad we will consider choosing alternative experiences. Where to stay near Svartisen? You can do the trip to Svartisen as a day-trip from Bodø. 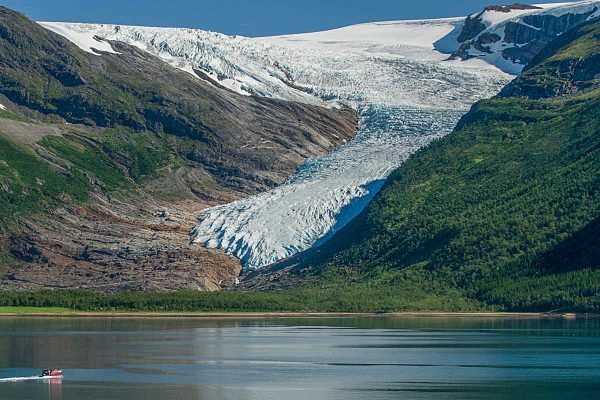 Staying at least one night near the glacier is recommended. Simply because of its very nice surroundings. Highly recommended. Charming old farm. Cozy huts with shower, toilet and electricity. 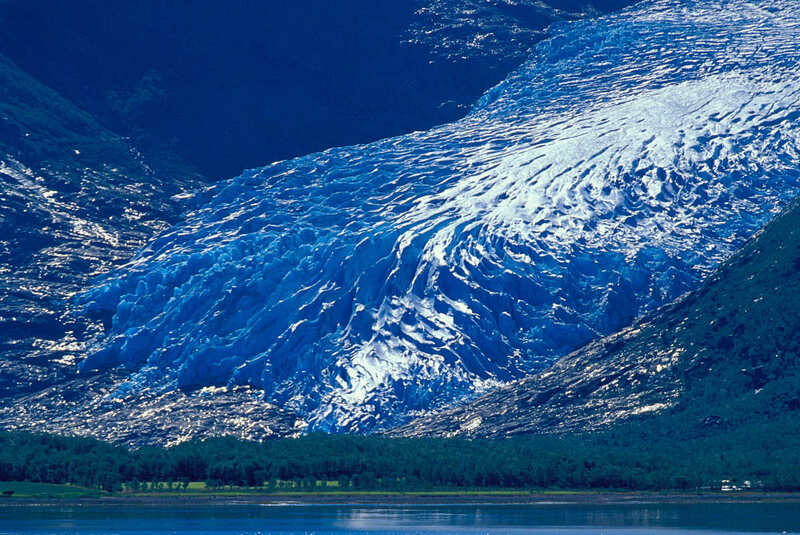 Start Exploring Svartisen Glacier Today!